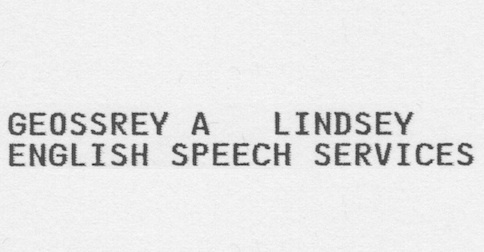 I returned home from UCL’s Summer Course in English Phonetics to find a letter from an American organization addressed to ‘Geossrey A Lindsey’. I’d previously given my name over the telephone to an employee of this organization, a native speaker of American English. Twice I spelled my name out to her, believing that I was speaking clearly, and she spelled it out back to me, to my satisfaction. But still the error happened. In the case of my transatlantic conversation, the employee didn’t have the appropriate contextual expectations for her brain to fill in the right letter. The spelling Geoffrey is a lot less common than Jeffrey in the United States, and Geossrey evidently seemed to her a possible name for a distant Englishman. And, when she spelled Geossrey back to me, I didn’t hear that she was saying /s/’s rather than /f/’s. Probably I should have used the NATO spelling alphabet and told her that my name is written with Foxtrot Foxtrot, not Sierra Sierra. Aside from the challenges of telephones, a take-home message for non-native English speakers is that the English /s/ is strong and loud, distinguishing it especially from weak /θ/ and /f/, and also is high in quality, to distinguish it from the lower-pitched /ʃ/. In languages where /s/ does not have to be distinguished from /θ/ or /ʃ/, it is often weaker or lower-pitched in quality than in English.